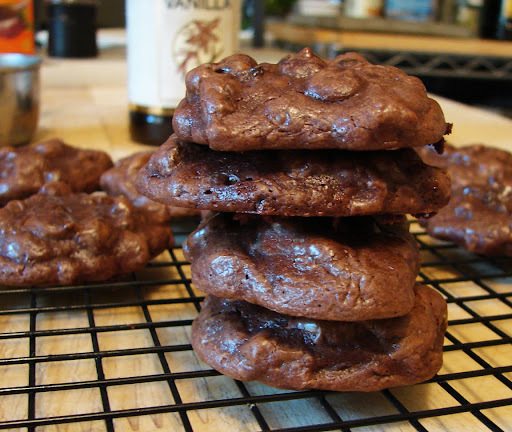 Food Wishes Video Recipes: Michele's Chili Chocolate Cookies – I'd Love Them Even If She Wasn't My Wife! 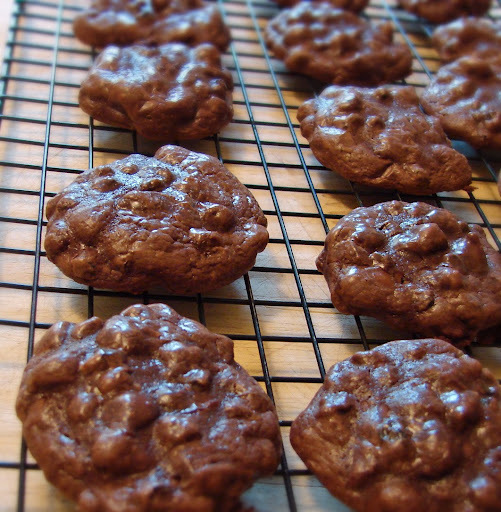 Michele's Chili Chocolate Cookies – I'd Love Them Even If She Wasn't My Wife! The recent post which featured Denise from ChezUs' beautiful dark chocolate macarons with bittersweet ancho chili ganache reminded my wife Michele that it'd been a while since she'd whipped up a batch of her famous chili chocolate cookies. These dense, dark, and dangerously addictive cookies feature a dose of black pepper and cayenne, which to some may seem like an odd addition. But one taste and you'll understand the method to this madness. Just like adding a pinch of salt to dessert recipes makes them even sweeter and more delicious, the addition of pepper in this cookie really makes the chocolate even more chocolaty. The cookies aren't really "spicy," but you can definitely tell something strange and wonderful is happening. I'm terrible with keeping my secret ingredients, secret. As soon as someone says, "Hey, what's in these?" I spill the beans. However, if you're one of those sadistic cooks that loves tormenting your foodie friends by not telling them what that certain something is, then this recipe is for you, since the spices are very hard to identify. A couple notes about the recipe ingredients below. I use kosher salt for just about everything, but I always have to remind myself that it has a much flakier, larger grain, so 1/2 teaspoon of kosher salt is really like 1/4 teaspoon of fine table salt. The measurement below is for fine salt, so double it if you also use flake-style kosher salt. Also, Michele decided to reverse the chocolate blend in the original recipe by using 2 parts unsweetened chocolate to 1 part bittersweet. If you like really sweet cookies use 2 parts bittersweet to 1 part unsweetened. If you're not sure, make 4 or 5 batches and experiment with different combinations. You really can’t practice too much when it comes to these strange, but spectacular cookies. Enjoy! Note: Special thanks to Sigve Hoel who gifted me a sweet new set of OXO mixing bowls! He saw them on my Amazon Wish List (in the sidebar in case you're wondering). Thanks Sigve! We LOVE them. OMG! I totally forgot to mention the new bowls in the voice over!! I LOVE them, thanks sooo much!! I just added a special thanks to the bottom of the post! Thanks again! Great recipe! Is there something I can use instead of Khalua? Something non-alcoholic? i'd love to try these! my mom made mayan chocolate cake which also has chili and i loved it. this looks like an easy cookie version! is it possible to replace the currants with something else? raisins? sultanas? Yum; I love adding spicy ingredients to my baked goods...I always add chili powder because it gives baked goods a nice kick....this recipe looks delish. Can't wait to meet you this weekend in San Fran for the Foodbuzz Festival! Likewise! Are u going to the opening cocktail reception? I love the way you speak in your videos, even a dummy can produce your recipes!!! And this one is very nice! Your chicken wing video was featured on another website today. such a wonderful adult treat! Where would one find Dried Currants? With the dried fruit (cranberries, etc)? How much of a coffee flavor does the kahlua give? We don't like coffee, but these sound awesome. what do you have your cookie dough baking on? heyy Chef John, I made those cookies last night and they are ABSOLUTELY delicious. Although instead of Kahlua (I couldn't find it) I added Bacardi and some coffee. Thanks for the recipe. Can I replace cayenne pepper with chilli powder or double up the amount of black pepper instead? chili powder is much different, and double bp would be too much, just leave out. Thanks Chef John! I'm going to try out this recipe tonight! BTW, regarding the unsweetened chocolate, is it the same as baking chocolate? I was able to get bittersweet chocolate but only saw 'No sugar added' milk chocolate at the store. yes, usually baking chocolate is unsweetened, but it should say. Hi, I realize that you only use normal fine sugar in the making of your cookies, can I have your opinion regarding replacing some fine/white sugar with brown sugar? Lastly, I never like raisins in my chocolates or cookies, but can I know roughly what is the taste of mixing raisins and kahlua together? Thanks! Any suggestions for doing making this recipe for a diabetic? sorry, I don't. I'm sure there are tons of websites that have versions for you though. Really delicious cookies! I tried them today and they turned out great. They were a bit flatter than yours, but I actually like flat cookies. Help! I made these and they are sooo delicious, but they retained their ball shape throughout cooking. I don't know what I did wrong. I am making them for a party this weekend. Can you help? No idea!! Maybe overmixed? That's strange. Could I make the dough a couple days in advance and keep it in the fridge (or freezer)? Any downside to that? Thanks, I look forward to making this for Christmas! You use cayenne pepper a lot in your receipes, can I substitute it with Indian red chilli powder? This is a very, very, very good cookie. This an adult chocolate cookie. Kudos to your wife, and kudos to you for marrying her. I made a cocktail to accompany them: 1 part Bailey's, 1 part Chambord, 1/2 part creme de cacao, 1/2 part vanilla vodka, 1 part creme. Shake with ice, serve in a martini glass, shave a touch of nutmeg over the top to garnish. Cookies and milk for adults. I love the idea of milk for adults! And I love this recipe. Made them couple times, I didn't find cayenne though so I used dried chili peppers and they worked fantastic. I also often substitute dried currants with candied orange peels and kahlua with cointreau. Amazing. Last time I used home made butter and they turned just excelent. If I leave out the Kahlua and currants do I need to put in more liquid? Less maybe? Will the taking out of those two affect this recipe? Besides lost deliciousness that is- my family equates dried fruits in cookies as blasphemy. you can omit, but not as good! On the Kahlua, could you use instant coffee as a substitute or regular coffee? Sorry, not really the same. I don't have Kahlua at home, but I have brandy and dark rum. Which one would be the closest substitute in terms of taste? Are these the crunchy types or soft, Chef John? Could I request a biscuit video, like ginger snaps? Put in wayyyyyyy too much butter, tried to compensate with extra flour, used cold eggs instead of room temperature. Ended up with cookies that oozed all over the tray! Felt like crying but i'm gonna try it again. wish me luck! Chef John, could I request your reply. I am keen to try these. Are these the crunchy type cookies or soft? Could I also request a biscuit video, like ginger snaps? they are mostly soft, with a little crisp around the edges. In case you do a ginger snap/biscuit recipe, a healthier version would be great! Keep up the fab work! You do make cooking easier for many of us! Chef John, can teenagers and children under 18 eat these cookies with Kahlua? Also, how long can these cookies be stored after baking? Many thanks in advance to you and Michelle. Hi, these cookies look wonderfully interesting. Did I read the ingredient list correctly? Is it really only 1/2 cup of flour? Yes, 1/2 cup, but not sifted first. Just scoop it out of the bag. I apologize for even asking, but any suggestions for a sub for the currants that's not fruit? Could I sub nuts for the currants? Of course!! They're your cookies! Put what u like! This recipe looks fabulous. I can't wait to try it. Putting up the Christmas tree today and baking cookies tonight. These will be on my list of Christmas cookies this year. If you have a recipe for a great ginger snap, please let me know. I love ginger snaps, but they have to be flavorful, and with a good snap. Many recipes I've found are chewy. They should be called 'ginger chews', not snaps. I baked these yesterday with a friend and we used Amaretto instead of Kahlua. The results were amazing and I find it hard to imagine that using Kahlua would make them taste any better. I handed out a few at a dance Sunday night and floored everybody. My local grocery store does not carry dried currants and all of amazon.com's "currants" are actually just dried grapes. Where do you get dried black currants from? I am reluctant to substitute dried grapes since they are so bland. Maybe dried cranberries or dried tart cherries would work. Finally got all the ingredients together and made them today with my daughter. We've been looking forward to this for a while. The cookies are delicious, and we love the cayenne and peppery bite to the rich chocolatey flavor. Thanks for the recipe. I just made these cookies and ate one while still warm. So good! I substitutet the currants with raisins and did a few other minor changes, because I'm the boss of my cookies. ;-) They came out really delicious! Thanks for the great recipe. Greetings from Germany! I after I added in my chocolate mixture, my batter started to thicken up a lot instead of being liquidy like yours. Any tips? Thanks! I'd never thought that it would turn out to be this delicious!! Thanks for sharing this recipe Chef John! What makes people think these cookies aren't suitable for kids? There's 2 tbsp 20% liqueur in the entire batch. That's 30 ml, or 6 ml ethanol, which is 0.6 units. In 24 cookies that's 0.025 units each. How many Units to get little Timmy tipsy? 3? That's 120 cookies without taking into account you let most of it evaporate in the pan and oven, and that the cookies you're not "drinking" on an empty stomach. Do you measure your flour by spooning it into the measuring cup, or do you dip-and-sweep it? I'm more used to weight measurements. Thanks! Sorry, I honestly don't remember! These were too sweet for me, but too delicious and intriguing to leave behind, so I tweaked. I subbed 1/2 cup of cacao nibs and 1/2 cup chopped bitter (not unsweetened) chocolate for the for chocolate chips. This helped a lot! Would reducing the sugar mess with the chemistry? Just made these, they are fanfreakingtastic. Can't wait to try your tomato bisque recipe next! Chef John, you are a gentleman and a scholar. I was very excited to make these cookies, but upon tasting them I was disappointed to find out they taste just like Dutch chocolate 'pepernoten'. You can buy those in any supermarket and many other stores in the Netherlands from October to December. Hi dear... Let me start with I LOVE YOUR WORK!!! I'm planning at last to get to this recipe.. But I'm making it for my daughter's birthday so NO Kahlua... Can you advise me with something to replace it with?? PLEASE?!? For anyone wondering, dried BLUEBERRIES worked great as a sub for currants. I used dried wild blueberries and espresso as I discovered I was out of kuhlua. These are worth making.